Beautifully designed apartment homes just for you. Here at Margarita Summit we offer modern and comfortable interiors and upgraded exteriors to make your choice to live with us easy. We are committed to giving you the best living experience possible! We have apartment homes of quality & style... In your mind you've pictured yourself coming home to a community like Margarita Summit Apartments. 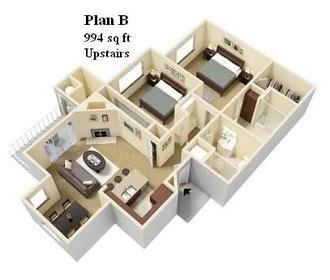 These very spacious two bedroom two bath apartment homes are filled with features you will appreciate, including dramatic vaulted ceilings, spacious patios or balconies, central heating and air conditioning, wood burning fireplace and an abundance of closet and storage space. Our apartment homes offer a full appliance package which includes in home washer dryer. You will love the custom cabinetry, stone counter tops, wood-vinyl flooring spacious tubs with built in shelves and many more ideal upgrades! Some special features include *walk in pantry's in the kitchen and a *built in desk in the hallway for your convenience. Unwind with an invigorating game of tennis or a workout in the fully equipped fitness center. Afterward, cool off with a refreshing dip in the sparkling pool or relax in the warm soothing spa. We are also just a short distance from a wide variety of recreational opportunities such as wine country, Old Town, and much more. Margarita Summit is a community you'll be proud to call home. For more information please call us today at 951-676-1921 or email us at info@margaritasummitapartments.com. We look forward to assisting you in finding the perfect apartment home.